Both the Prime Minister, Theresa May​, and the Labour leader, Jeremy Corbyn​, are offering the people the same thing. Cake. They both think that it’s possible for us to have a cake and eat it. 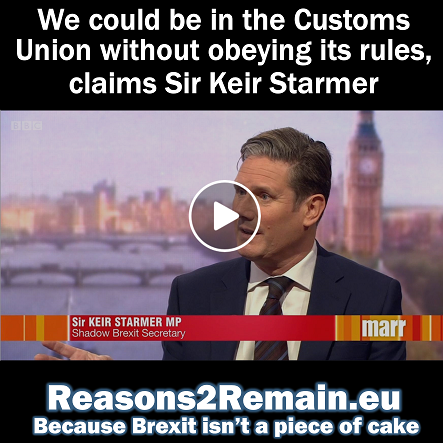 That’s their answer to Brexit, and it just shows how little they understand about cake… or how the EU functions. Theresa May expects us to keep most of the benefits of EU membership – what she calls ‘frictionless access’ – without being an EU member, or staying in the Single Market or the EU’s custom union. Even before the referendum, Mrs May said that the EU was unlikely to give Britain a better deal than their own members enjoy. Even though she’s constantly reminded by EU leaders that it’s simply not possible to have her cake and eat it, she keeps expecting just that. 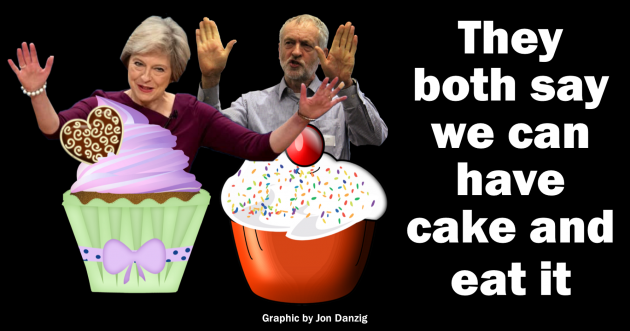 Labour leader Jeremy Corbyn is also expecting cake after Brexit. And, just like Mrs May, he also does not want Britain to be a member of the EU, or the Single Market, or the EU’s custom union. The only slight difference is that Mr Corbyn says that Britain would be in ‘a’ customs union with the EU, but not ‘the’ customs union. Again, it just won’t work. It’s classic ‘cake and eat it’ fantasy. ‘Jeremy Corbyn’s plan is just as fantastical as Theresa May’s’. 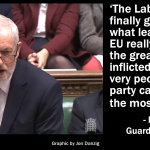 But Mr Corbyn also confirmed that the UK would not be subject to the rules of the EU and its Single Market, such as Free Movement of People, and would be free to negotiate its own independent trade agreements with other countries. 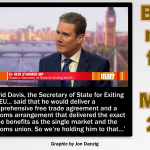 Labour is playing as dangerous a game as the Tories, pretending to us that we can enjoy the benefits of the EU and its Single Market, without having to be in it, or having to accept its rules such as Free Movement of People. 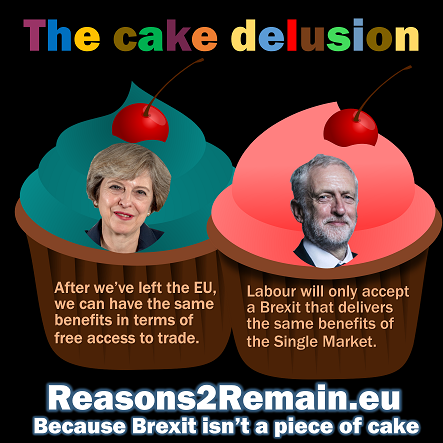 Labour is trying to fob us off with cake, just like the Tories. No country in the world enjoys the benefits of the Single Market without being signed up to it. 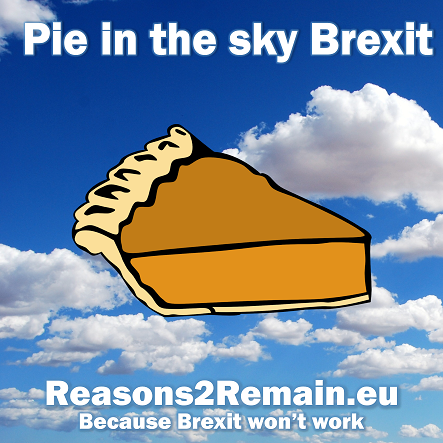 The EU has already rejected Britain’s cake fantasies, but we keep being told we can have the cake, and we can eat it. What’s the point of a club if you are going to allow non-members to enjoy the same or better benefits as members? What club allows that? Both Theresa May and Jeremy Corbyn need to be honest with the nation and explain clearly what Brexit means. It means loss of jobs and industry. It means the country suffering economically. It means losing comradeship with our allies in Europe. After all, that’s what Theresa May and Jeremy Corbyn told the nation before the referendum. This is the bottom line: We can have Brexit, or we can have EU benefits, but we cannot have both. And if we lose EU benefits, the country will suffer. For Mrs May and Mr Corbyn to pretend otherwise is a shocking betrayal of the country. And it’s daft, because sooner or later the country will find out the truth. Then, the Tories and Labour will have to own up to their dishonesty. Wouldn’t it be better to own up now, before it’s too late, and for the sake of the country? This entry was posted in Current Affairs, Democracy & Citizenship, Economics & Trade, Politics & Public Policy, The EU and tagged brexit, cake, David Davis, European Union, Jeremy Corbyn, Theresa May. Bookmark the permalink. Next: How did we get stuck with Brexit?